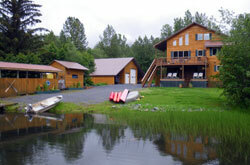 Nestled in a magnificent setting on the shores of a forested alpine lake, Bear Lake Lodgings offers you the opportunity to experience Seward, Alaska, in comfort and style. Booking direct helps us keep our prices lower for you! Bear Lake is Seward's fresh water playground, and the lodge sits right on the shore. 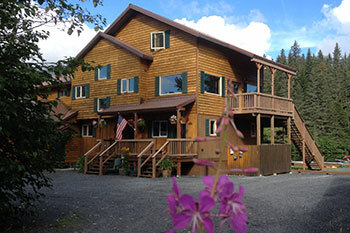 Your stay here is sure to be the highlight of your Alaskan adventure. With hiking trails out the back door, glassy waters perfect for a morning paddle, and a large deck that enjoys the late Alaskan summer sun, our bed & breakfast is the ideal base for all your adventures in the Great Land. Take a canoe or kayak to watch the salmon swim upstream during the height of the sockeye run. Set off from the back door and hike the historic Iditarod trail, or climb 4,300-foot Tiehacker Mountain. 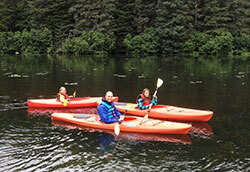 The lake and its surroundings afford countless ways to enjoy tranquility or to find adventure. The bed & breakfast offers four rooms, each with its own unique characteristics, including a suite with access to viewing decks, two upstairs rooms with tranquil views, and an apartment-style vacation rental. A hearty full breakfast is also included with the pleasurable accommodations. Find out more about our rooms or breakfasts, and learn about our exclusive discounts and value-added offers.